Volunteers Ken Gonyo & Diane LaRue ‘discovered’ this thorny palm – a Senegal date palm (Phoenix reclinata) growing between 2 native cabbage palms (Sabal palmetto), as well as few other smaller individuals. The Florida Exotic Pest Plant Council (FLEPPC) lists the Senegal date palm as a Category #2 invasive pest plant: “Invasive exotics that have increased in abundance or frequency but have not yet altered Florida plant communities to the extent shown by Category I species”. Folks who do landscape maintenance tend to hate this palm due to its very long & nasty thorns. A sizable specimen shades the wooden deck on the west side of the nearby Florida Medical Entomology Laboratory. 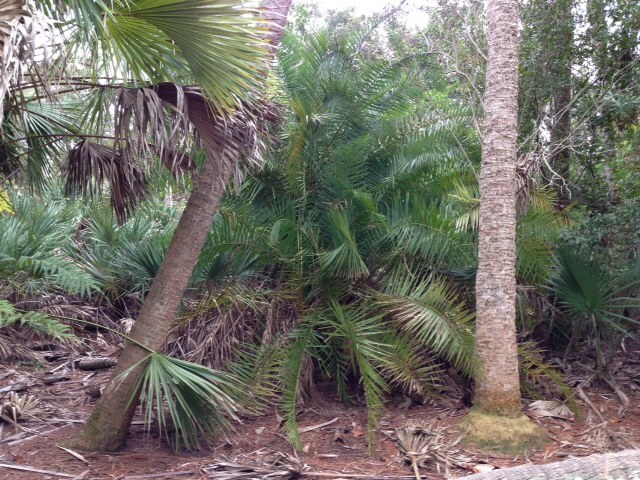 Thanks for Ken for the photograph of this African palm that does not belong at the Oslo Riverfront Conservation Area. Previous Entry Holly berries or pink peppercorns?